Increasing air pollution, ozone layer depletion and radioactive emissions are hurting our climate drastically and dramatically. Unexpected changes in the climate is a now a routine across the globe. Over two decades of research by the American Heart Association has established that random changes in temperature hugely affect the various physiological systems, with cardiovascular system at top of the chart. Heart rate variability or the tendency of the heart to regularize the heart beat as per the requirement is an indicator for heart health. A recent study found that increase in temperature reduces the heart rate variability and thus increases the risk of death following a heart attack. An epidemiological study in the developed nations showed that extreme high or extreme low temperatures increases hospital admissions due to heart related problems like arrhythmia and stroke. Higher temperatures lead to formation of ozone and thus reduce the volume of oxygen in the air. Studies show that such changes affect the gas exchange between environment and body via lungs and therefore increases stress on the heart and may lead to cardiac stroke. Higher temperatures and droughts around the world increases particle pollution in the air which, on long term, causes deep vein thrombosis, pulmonary embolism, reduced heart function, and dysfunctional blood vessels. 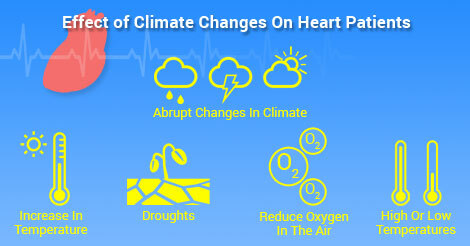 Abrupt changes in climate affect psychology of a person and may lead to problems like stress, depression, and anxiety. All these psychological problems have been recognized as potent precursors of cardiovascular diseases.